To me cooking outside is half the fun of camping. For some reason, everything tastes better when it is cooked and eaten outside whether it is cooked over a fire, on a charcoal grill or on a gas grill. And yes, I always have all three methods available on every camping trip along with the outdoor cookstove on my popup camper. I like having the choice of how to cook food but my husband thinks it is crazy to take a portable gas grill, a tripod for over the campfire, and a small charcoal grill on every camping trip. But, to his credit, he just packs them all for me and doesn't complain too much. He probably thinks I won't cook for him if he grumbles a lot, which is probably true! Today I read about the Volcano II Cook Stove which is one stove that folds down for easy and compact storage, plus a person can cook with it using wood, charcoal or propane. That means this one product will do the same thing as my tripod, smoky joe charcoal grill, and Weber portable gas grill. Plus the price is reasonable considering how versatile it is. The Volanco II with the propane attachment kit is $139.95. That may seem like a lot of money, but it's a deal compared to the nearly $300 I paid for my gas grill, tripod and charcoal grill. Plus it's only 1 item to store instead of three and most campers are well aware of how precious storage space is! 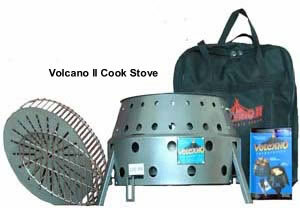 The Volcano II with Propane Attachment Kit comes with a top and bottom grill, storage bag, propane attachment kit, wrench for adjustments, deflector plate (lowers heat and allows stove to act as a warmer to keep things like soups and stews warm), and a user's manual. Plus it has a full one year warranty. For more information watch the video below or visit the the company's official website.